A move spearheaded by Canada that enlisted global allies in an effort to rebuke Beijing for its repression and surveillance of Muslim populations in Xinjiang is being criticized by the Chinese leadership. China said Thursday that 15 foreign ambassadors, including the envoy from Canada, exceeded their diplomatic roles by issuing a letter expressing concern about the incarceration of hundreds of thousands of members of the country's Muslim minorities in re-education camps. Chinese Foreign Ministry spokesperson Hua Chunying told reporters at a daily briefing that it would be "problematic" if the diplomats were attempting to put pressure on local authorities in the northwestern region of Xinjiang, where the detentions have taken place. Hua said the letter violated the terms of the Vienna Convention governing diplomatic relations, and that the ambassadors should not "interfere in the internal affairs of other countries." "As ambassadors, they are supposed to play positive roles in promoting mutual understanding, mutual trust and co-operation ... rather than making unreasonable requests to the countries where they are based," Hua said. She said the letter issued this week and reportedly spearheaded by Canada's ambassador, John McCallum, was based on hearsay, despite widely distributed reports from detainees, relatives and officials documenting the sweeping and seemingly arbitrary detentions. 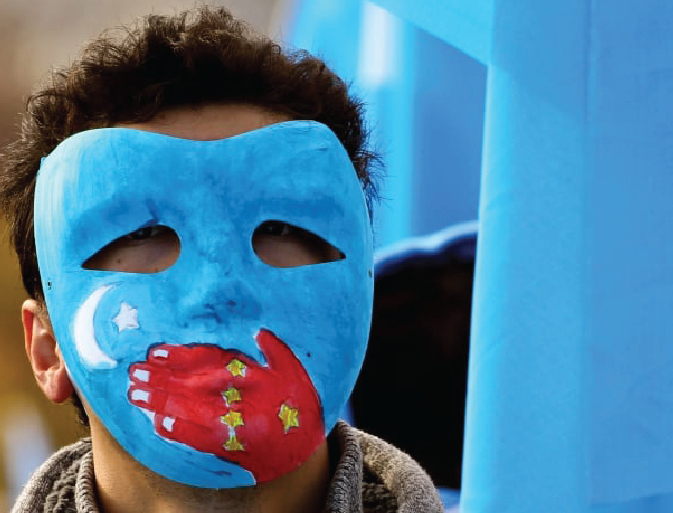 "As part of the Universal Periodic Review, Canada called on China to release Uyghurs and other Muslims who have been detained arbitrarily and without due process due to their ethnicity or religion," Global Affairs Canada said in a statement. "We also called for China to end the prosecution and persecution on the basis of religion or belief, including for Muslims." Asked about the letter, Canadian Prime Minister Justin Trudeau said he had "highlighted the questions and concerns that we have" surrounding the issue in his bilateral meeting with Chinese Premier Li Keqiang on the sidelines of the annual summit of the Association of Southeast Asian Nations in Singapore. "Canada will continue to look for ways to advance and promote human rights in partnership with our like-minded allies everywhere around the world," Trudeau said at a news conference Thursday. The letter to the Chinese government has not been made public, but Reuters said it was signed by 15 Western ambassadors, including the Canadian, British, French, Swiss, European Union, German, and Australian envoys. Hua's comments came as a bipartisan group of U.S. lawmakers is bringing a measure to urge President Donald Trump to help Chinese Muslims respond to the crackdown. The legislation would urge Trump to condemn "gross violations" of human rights in Xinjiang, where the UN estimates that as many as one million Uighurs and other predominantly Muslim minorities are being held in arbitrary detention. It would also support an existing push for sanctions against Xinjiang Communist Party chief Chen Quanguo and other officials under the Magnitsky Act, which prevents foreign officials from entering the U.S. and freezes any assets they have in U.S. banks. Other sanctions raised for consideration by the act include a ban on sales of U.S.-made goods or services to Xinjiang state agents such as those that could be used for surveillance and suppression. Chinese authorities have denied that the internment camps exist, but say petty criminals are sent to "employment training centres." The Xinjiang government has revised regulations to officially permit the use of "education and training centres" to reform "people influenced by extremism." The rules direct the centres to teach the Mandarin language, occupational and legal education, as well as "ideological education, psychological rehabilitation and behaviour correction." Xinjiang's native Uighur and Kazakh ethnic groups are culturally, religiously and linguistically distinct from China's Han majority, and the region has been home to a low-intensity rebellion against rule from Beijing. Many of the region's natives say their culture is under threat from Chinese policies aiming to assimilate them and that they face disadvantages in education and employment from Han migrants from other parts of China. Members of the Muslim Hui ethnic group — culturally and linguistically closer to the Han — have also been ensnared in the campaign that has drawn comparisons to Mao Zedong's radical 1966-76 Cultural Revolution. Also on Thursday, China's cabinet released a report titled "Protection and Development of Xinjiang Culture" that stressed the importance of adopting Mandarin Chinese among ethnic groups and referred to their Islamic faith as "religious culture." "Xinjiang adheres to the historical tradition of the Sinosization of religion and actively adapts religion to socialist society," the report said.